Despite cypress trees cut down, activists are not giving up and they keep trying to reclaim their right to the city. After three months of peaceful protests against a controversial construction project and in defense of preserving a nearly century-old cypress park in the center of Bar, a port city on Montenegro’s coast, it looks like the battle has been lost. 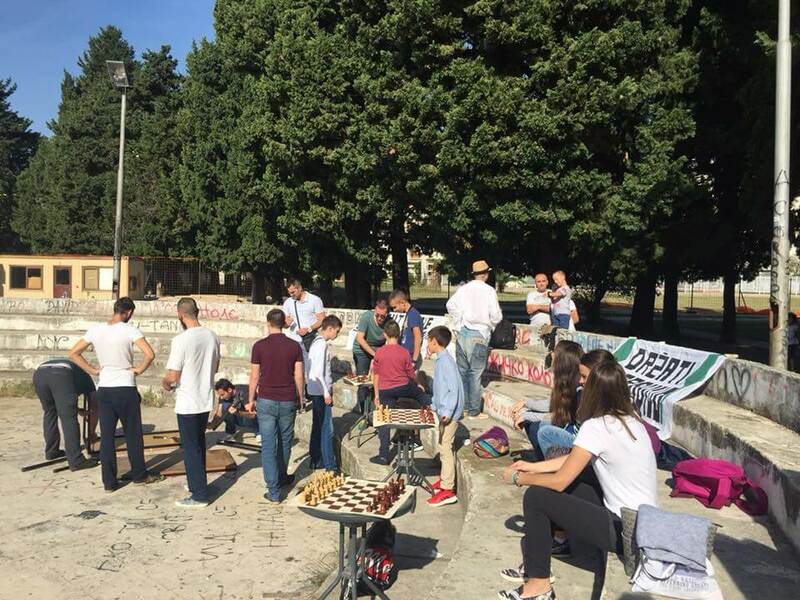 However, Sonja Dragović tells us with this article, activists are not giving up: by responding to the government’s oppressive and deceitful tactics with hopeful, creative, and sustained acts of resistance, they keep trying to reclaim their right to the city. 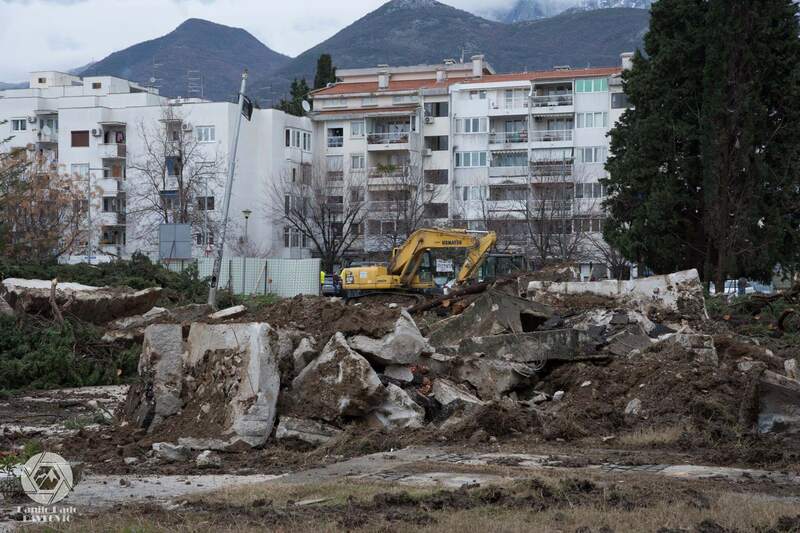 The Montenegrin city of Bar, an Adriatic Sea port, suffered a major loss last Thursday morning: when around 90 cypress trees, almost 100 years old, were cut down in an attempt to clear a plot of land for the construction of a new kindergarten. This regrettable action is not, as it may initially seem, the result of a lack of space for much-needed new pre-school facilities, but a direct consequence of urban planning malpractices that have had a detrimental effect on the development of the entire country. In this particular case, the lack of accountability and transparency – together with systemic discouragement of meaningful public participation – produced a disastrous result. The only possible silver lining is the newly awaken energy of civil disobedience and communal solidarity rediscovered among the citizens of Bar, who are determined to stand up for their park, their schools, and the future of their city. The works were announced on October 15 when Bar’s mayor, joined by the Minister of Education, set the foundation stone while casually noting that the new pre-school facility will be built between the buildings of two existing schools, where the old cypress park was located. Even though this face was announced as a matter-of-fact, not-to-be-discusses-any-further, even joyous piece of news, the protests began almost immediately: with a group of high school students starting to shout at the politicians participating in the ceremony, expressing their readiness to oppose the works and the implied destruction of their schoolyard, of which the park is an inseparable part. In the following days the broader community began organizing in support of the cause. The first attempt to cut the trees down was stopped by human shields, night watches were constantly organized, and a petition that asked for the park to be protected and for the new kindergarten to be moved elsewhere gathered more than 3,000 signatures. Meanwhile, students turned the protest into a festival dubbed “About Cypress Trees and People,” converting the park and the small amphitheater within its limits into a constantly occupied stage for local artists, debates, lectures and workshops. Persistence paid off, at least temporarily: the local parliament was persuaded into stopping the works and holding a special session to discuss the issue and vote on how to proceed. On November 15, the petition was dismissed: 14 opposition members of the local parliament supported the protesters, while the ruling majority did not: 7 were against their demands, while 13 were undecided. Activists agreed to continue advocating for their cause by using other legal instruments, primarily to examine the urban planning procedures that led to this outcome. The only possible silver lining is the newly awaken energy of civil disobedience and communal solidarity rediscovered among the citizens of Bar, who are determined to stand up for their park, their schools, and the future of their city. The plan for this construction project and everything it entailed was not new – it was simply not discussed in public until the works were about to begin. The detailed urban plan which placed the kindergarten in the schoolyard was adopted in 2009 by the local parliament; upon closer inspection, it seems to be flawed, full of contradictions, and outdated. The building permit was first obtained in 2014 and renewed in 2017; it was issued even though the necessary documentation seems to be incomplete and the project itself is, to put it mildly, of dubious quality. All of these shortcomings have been discovered and publicized by local activists, who have submitted a request for inspection to the planning and construction authorities and filed an appeal to the Administrative court of Montenegro. None of this really mattered: during the winter school break, while the procedures for assessing the validity of the plans were still ongoing, early in the morning of January 17, without warning, the trees in the cypress park were cut down. Since the official construction plan didn’t even account for this greenery (which was one of the aforementioned shortcomings), the authorities didn’t provide any official information on what portion of the park was to be destroyed, or why the works couldn’t wait for the official ruling on citizens’ appeals against this decision. Construction firms hired to do the work came from other cities; when the activists tried stopping them, the local police interfered and literally carried the protesters out of the park. According to activists’ accounts, 91 out of 127 cypress trees were cut down. The damage Bar suffered is irreparable. The centrally located park provided protection from the strong sea winds and erosion, representing a natural oasis for the school yard and was, by all accounts, a beloved local landmark. So, why did this happen? In short: because it was convenient for the government, and because the wishes, needs, and long-term interests of the citizens are not the government’s prerogative. A longer answer would have to take into account flawed spatial planning procedures, which have for decades deliberately excluded people from the decision-making processes. The usual strategies of exclusion include lack of promotion for obligatory public consultations, failure to provide the necessary materials in time and in a format accessible to the wider audience, and the deliberate withholding of important (and possibly unpopular) facts. The goal is to have the consultative procedures formally fulfilled but essentially rendered meaningless, designed to confuse the wider public and discourage citizens from getting to the bottom of the planning process. What lies at the bottom is, of course, private interests: turning public space and public property into lucrative business opportunities for privileged individuals. Construction firms hired to do the work came from other cities; when the activists tried stopping them, the local police interfered and literally carried the protesters out of the park. According to activists’ accounts, 91 out of 127 cypress trees were cut down. The case of Bar is not fundamentally different, even though the building in question is a public kindergarten – not a new tower built by some controversial “strategic investor,” as is usually the case. By placing the new pre-school facility for 400 children in the existing, already crowded schoolyard mostly used by high schoolers, the local government and the Ministry of Education have violated existing planning rules and prescribed construction codes. Such a decision, however, was strategic: it preserved some other piece of publicly owned land in Bar for future, money-making construction projects. In this business calculus a public park could only ever be a nuisance, an obstacle to get rid of – and that’s exactly what happened, common sense and public interest be damned. One of the many sad ironies of this episode is that the construction of the future kindergarten is funded with a credit from the Council of Europe Development Bank, an institution whose Environmental and Social Safeguards Policy clearly states its commitment to promote good environmental practices. The park is gone, but the protests in Bar continue. The activists are determined to protect the space of the school yard, stop construction, and pressure the government to move the future kindergarten to a different location. Even after the park was destroyed the protestors’ tactics have remained peaceful, offering messages of hope and new beginnings by planting new trees and lighting up candles for the fallen ones. Authorities are, however, determined to proceed: a few days after cutting down the trees they demolished the amphitheatre (affectionately called “the circles” by students who have used it as gathering spot for generations). Valuable artwork by Japanese artist Yasushi Hori, who had spent some time in Bar as an artist in residence decades ago and donated several sculptures to the school at the time, would have also been destroyed if it wasn’t for the swift reaction of a couple of school teachers. The construction site is currently being secured by a private security company, separating the protesting crowd from the “cypress graveyard,” as students now call the grounds surrounding their schools. By placing the new pre-school facility for 400 children in the existing, already crowded schoolyard mostly used by high schoolers, the local government and the Ministry of Education have violated existing planning rules and prescribed construction codes. It is difficult to predict what happens next. Support for the local activists’ cause is being constantly voiced by numerous non-government organisations, media outlets, opposition parties, and citizens from other parts of Montenegro. The people of Bar who are old enough to vote, of whom only 47% turned out for the local elections last spring, seem to be much more interested in participating in the decision-making process now, after witnessing the results of the local government’s efforts. The youth of this movement – most of them still in high school – are skilled in making social media reports about the situation and eager to hit the promotional channels of the local government, so much so that Dušan Raičević, the mayor of Bar, has deleted his Facebook account and declined to address his fellow citizens in the aftermath of the park’s destruction. One of the more prominent activists of this movement, philosophy professor and essayist Stefan Đukić, stated in a televised debate (for which none of the government representatives showed up) that the decision-makers are trying to forcefully finish this foolish project because they are terrified to show weakness, to admit their obvious wrongdoings and in doing so demonstrate that people’s actions can be powerful and effective. Indeed, the success of the local protests in Bar would be a rare precedent in recent Montenegrin history (along with Beranselo), and a much-needed demonstration that a different kind of politics is possible – that people can organize and win outside of clientelist networks and stale partisan politics that have kept Montenegrin democracy hostage for the last 30 years. This article was originally published on LeftEast. Sonja Dragović obtained a joint master’s degree in urban studies in 2015 through interdisciplinary program “4Cities”, comprised of four semesters of study and practice in Brussels, Vienna, Copenhagen and Madrid. Prior to this, she earned a bachelor’s degree in economics. Her main interests include analysing practices of urban activism and working with local communities towards improving participatory methods, public policies, and shared spaces.